Wisdom teeth, or third molars, are removed only if they are deemed potentially problematic. There are several reasons a wisdom tooth might be labeled as problematic. Factors that determine whether or not wisdom teeth must be removed include jaw size, crowding, proper occlusion, and impaction. 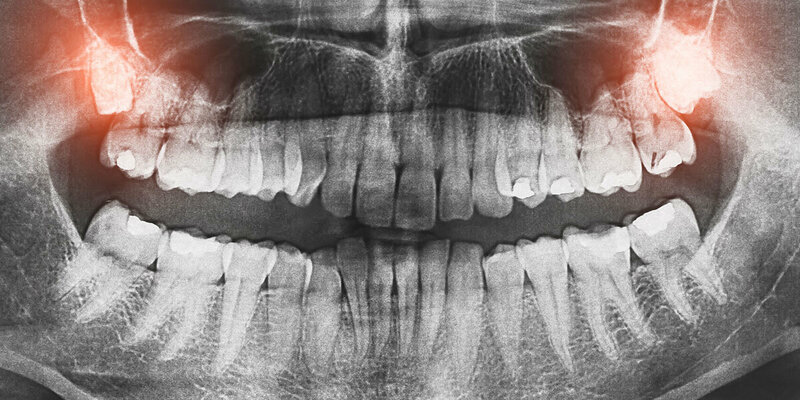 Often, radiographs taken at regular dental cleaning appointments will show when wisdom teeth extraction is recommended. May instead come in at an angle, pushing against the molars and causing overcrowding. May not erupt fully, remaining instead either partially or fully below the gum line. May cause bacteria to become trapped beneath the gum and lead to infection and gum disease. Wisdom teeth extraction is generally an effective means of preventing crowding of the teeth, impaction of wisdom teeth, red, swollen, or painful gums caused by a partially erupted wisdom tooth, and gum disease and tooth decay. Depending on the complexity of the extraction, the doctor will use local anesthesia, sedation, or general anesthesia to increase patient comfort during and after the procedure. Generally, the procedure can be performed in the doctor’s office.